Fear the Walking Dead has flushed away the gravitas of Nick's (Frank Dillane) death. Just in Case is a bewildering episode with a puzzling, though not unexpected twist. We get back to the events at the diamond, learning a lot more about Naomi's (Jenna Elfman) past. The character's motivations are seemingly made clear, then blown up at the end. The good guys continue to act foolishly, setting up a showdown that is utterly unbelievable. Just in Case opens with a Vulture looting a gas station. He even takes the light bulbs and door hinges. As he packs up a van outside, John Dorie (Garret Dillahunt) gets the drop on him. When the man tries to take his gun, John shoots a finger off. John wants to know what happened to Naomi. Al (Maggie Grace) is driving the MRAV with Victor (Colman Domingo), Alicia (Alicia Debnam-Carey) and Luciana (Danay Garcia) in the back. Alicia notices her rigged machine guns. Al shuts her down. She asks the questions. Victor wonders if she can just watch and record the fight. Al replies that she's done it before. Luciana says she can ask them anything, just drive them to the Vulture's rendezvous. John finds a map on the Vulture. He tells the man he's seen a map like this before. John threatens the man with his guns. Start talking about Naomi. 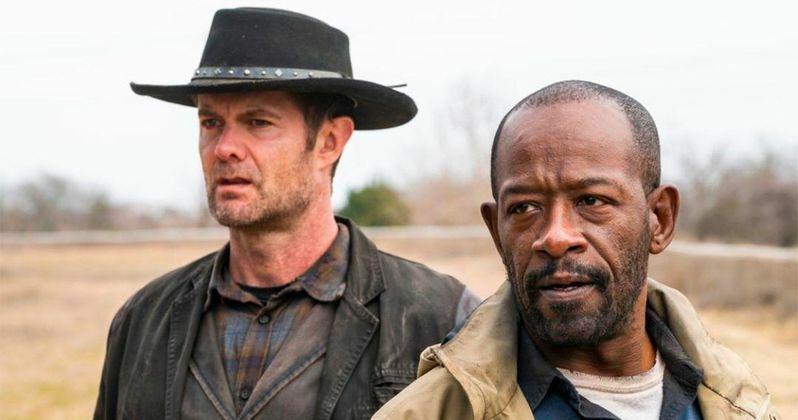 Morgan (Lennie James) intervenes. Inexplicably, he releases the man and warns him. People are coming to kill at the meet up. John gives Morgan his pistols. They get in the van and drive towards the meeting. A frame says "BEFORE". At the diamond, Naomi is bandaging wounds on Alicia's arm. Madison walks in the room. The hams Alicia found will only last a day. They need to go scavenging again tomorrow. Victor, Luciana, and Nick huddle over a map. Nick asks Victor where he found the car filled with supplies. Cole says nothing as Victor discounts it as luck. When Cole walks away, Victor catches up and thanks him for not revealing his secret. Cole replies he was worried what Victor might do to him. Madison brings Victor a bottle of found booze. They go to the lookout and watch the Vultures in the parking lot. Victor asks why Madison saved him at the dam. Apparently she rescued him from drowning and nursed him back to health in cave. She found Nick and Luciana as well. Madison claims "she likes to drink with him". Naomi tries to leave in an SUV, but is stopped by Viv holding a rifle. Madison tells her that she can take the truck and leave whenever she wants. Naomi says there is a FEMA base with supplies, seeds, and food. Madison and Victor decide to drive Naomi. The others remain at the diamond. That night, they find a motel to take shelter. They find a pair of walkers that killed each other over cans of beans. Naomi admits she was trying to escape. She planned to leave a map behind to the FEMA base. Victor calls her a coward, then takes the car keys. The next morning, Madison awakes to find Naomi gone. She has hotwired a car and driven to the base. Naomi goes to the chained front door and bangs on the glass. A horde of walkers surges toward the noise. At the hotel, Madison and Victor get ready to chase after Naomi. Victor says that people never change. Naomi sneaks in behind the walkers. She tears up as she walks through a room that housed children. She comes to a lockbox, then opens it to find a trove of supplies. She removes a book of planting instructions and a key with a tag that says "JIC". She goes to leave, but sees a painting of a handprint. She breaks down emotionally, dropping her flashlight. Obviously, the walkers hear and chase after her. She can't bring herself to shoot them. Naomi climbs on top of scaffolding as the horde surrounds her. Madison and Victor arrive. They see Naomi is surrounded. Naomi throws Madison the key and tells them to go. There's a truck in the back loaded with everything they need. Victor tosses a rope around the scaffolding and holds pulls it back over the walkers. Madison bangs on the metal as Naomi climbs over the undead. As they all escape to another room, Naomi tells her story. Her husband died soon after it started. She swore to protect her daughter, Rose. They came to the FEMA base. A woman named Ellen taught survival classes. Her philosophy was "Just in Case". Rose became very sick. Naomi locked her away, then secretly absconded to find antibiotics. When she came back three days later, Rose had turned, then bitten the others. The entire base fell because of Naomi's actions. As they leave with the loaded supply truck, Victor tells Naomi that "she can start over". At the diamond, Nick and Alicia walk towards Mel (Kevin Zegers) in the parking lot. They inform him that the wait is over. Mel turns around to see Madison driving the supply truck. He looks at the Vultures and tells them to pack up. They won't wait any longer. Mel approaches Madison's car window. He warns her to "be careful, you never see the bad stuff coming". The Vultures drive away. Everyone celebrates and unpacks the truck. Victor wants to talk further to Madison, but she doesn't feel like it, "We won today, let's leave it at that". Madison goes to the lookout and scans the perimeter with her binoculars. Alicia joins her mother, but is surprised. Madison tells her to pack up the SUV with medicine, supplies, and weapons...just in case. A frame says "NOW", the MRAV arrives at the meeting point. Al films while a heavily armed Luciana, Victor, and Alicia awaits. A blue van drives up to them. They are stunned to see Morgan and John come out. Morgan states that he warned the Vultures, that there will be no fight. He pleads for Alicia to stop, like he tried with Nick. They turn around to see a swarm of Vultures coming. The vehicles stop, Mel gets out with a machine gun. Morgan gets between the groups. Mel offers Alicia an apology about Nick. She does not feel the same about his brother. Morgan continues to block the standoff. Mel's radio chirps to life. The emergency SUV drives up behind them all. The group is stunned to see Naomi step out. She's not dead after all. Alicia, overcome with rage, shoots at her. But John is shot instead as he covers his beloved Laura. Hmmm...so Naomi/Laura is in league with the Vultures? Or is there another reason she survived whatever happened at the diamond? It would be preposterous for her to have broken down, gotten trapped, rescued, and then betrayed Madison. It was also ludicrous for Morgan to let the Vulture escape with the warning. This turn of events is absurd. Tune in next week to AMC as the twists keep on coming.